Although most of the medieval mystery plays were performed at the height of summertime, there is something very traditional about the idea of Nativity plays to celebrate the Christmas season. 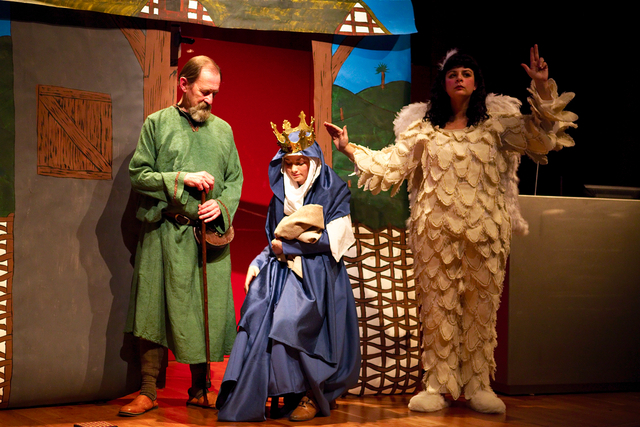 These are not the little dramas put on by the local parish children, however, but sophisticated plays which tell Biblical stories with both humour and sympathy. When invited to present medieval drama for the Friends of the British Museum’s December event, we wanted to choose stories that were seasonally appropriate, and a mixture of the familiar and unexpected. There is a pleasing symmetry to the tales of the shepherds and the wise men: mortal people, from both extremes of life circumstances, who receive the same heavenly message about the birth of Jesus, and who respond by journeying to visit the infant, bringing the gifts suited to both the holy infant and their own circumstances. 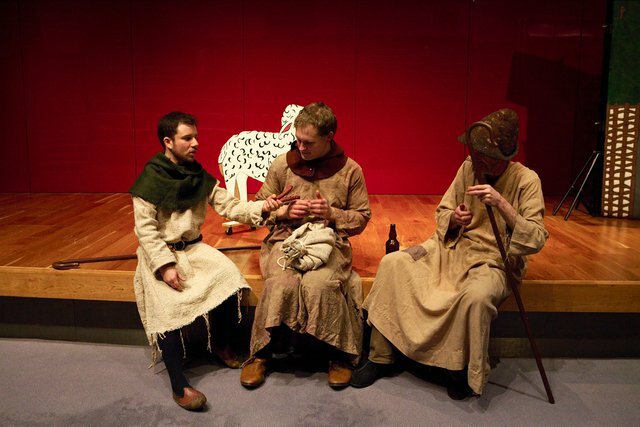 The Towneley manuscript contains two plays about the shepherds, the second of which is considered one of the glories of English medieval drama. The First Shepherds Play is much less familiar, but it is equally comical, and the plot is slightly easier to follow. It tells the tale of three shepherds who drown the many sorrows of their impoverished lives with drink and spirited quarrels. Their revelries are interrupted by the appearance of the Angel, who tells them of Jesus’ birth. The shepherds arise and proceed to Bethlehem, to meet the holy family. They have no valuables to give the baby, but they offer up the few precious trinkets that they possess. Though less sophisticated than the visitors who will follow them, their worship is no less sincere, and their offerings represent a genuine and sincere sacrifice. The comedy of the shepherds’ play is in contrast to the dignity of the Chester Offering of the Magi. This is the familiar Christmas story of the three kings who journey to Bethlehem to greet the infant Jesus. They enliven their travels together by debating the relative merits of the gifts they have brought for the baby; each king is convinced that his choice is best. They finally concede that gold, frankincense and myrrh are equally well chosen and indicative of the child’s future. One the way home from their visit, that troubled future is presaged by the arrival of the Angel, who warns them that they must travel by a different route if they are to avoid Herod’s wrath. This pair of contrasting plays, one comic, one serious, demonstrate the variety of drama within the canon of English medieval plays. 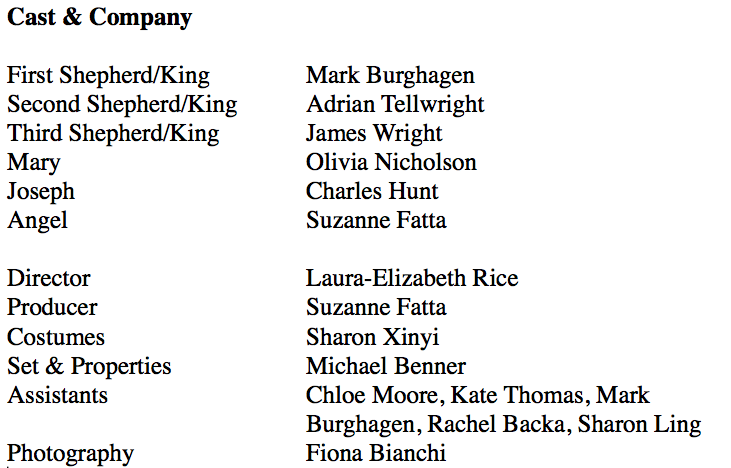 Though the characters are to a large extent ‘types’ rather than complex individuals, there is a very human element to the plays which makes them accessible to the audience, now or in the fifteenth century. Special thanks to Mike Forbester and St Mary Bishophill Junior for rehearsal space.